That’s it for now… once again, let me know you think below or find PGTC on social media by clicking the “Get Social!” tab. Oh, and don’t forget to tune in for the GRAMMY Awards this Sunday night at 8PM (Eastern) on CBS. When good ol’ September 30 comes around again, we all know that it marks the completion of the eligibility period for the 57th Annual GRAMMY Awards. So, being that it’s the day after, it’s the perfect time to make some new predictions and take a look what’s been happening this year in music. Though the big show doesn’t air until February 8 and a usual nominations special doesn’t air until December (I think it’s been renewed), here are some of my early favorites, and let me know what you think below! Given Streisand’s recent strong sales for her effort and that shining achievement of having #1 albums in six decades, I think the upper demo will get in on this one for a nod. (It would be her first nomination since The Broadway Album in 1987 and seventh overall.) The surprise release Beyoncé put out last December and the multi-Platinum success of the album should carry it to a nod, as well as some key nods in the R&B and Rap fields. Of course, Coldplay are GRAMMY darlings at this point, so it’ll likely be between them and U2 for who gets nominated. I’ll give the edge to the Brits; they have the biggest opening of 2014 so far and their biggest hit since “Viva La Vida” on the charts. The debut of Sheeran’s second album was also notable – he’s been nominated two years in a row in the Big Four, so he shouldn’t miss it. Lastly, there’s Sam Smith, another given. Obviously, this was a huge breakout year for him and he’ll be rewarded well. There’s usually some overlap in these two categories, so don’t be surprised if some of my predictions swap places. For now, Coldplay and Sam Smith seem like no-brainers since both have albums that are early favorites for AOTY. There is certainly no denying that impact of “Fancy” and what it achieved on the charts this summer, so it may be that it ends up in both fields for Iggy Azalea and Charli XCX, but it could also leave voters wondering about possibilities of Ariana Grande’s “Problem”, which features Azalea, and Charli XCX’s own “Boom Clap” for nods as well. I guess we’ll wait and see. Katy Perry’s collaboration with Juicy J and Sia’s solo track both stick out from a production standpoint and could make it in somewhere. Eminem and Rihanna were nominated for “Love The Way You Lie” several years ago, and since “The Monster” was just as big, they’ll make it in. Finally, there’s the endless talk of “Let It Go” and Frozen. Singer Idina Menzel should at least catch a nomination, while the soundtrack won’t be as lucky (the panel’s pretty inconsistent over the years.) The only Disney affiliated song to win the prize was “A Whole New World” (from Aladdin) in 1994. 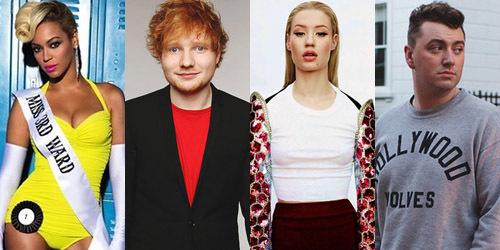 Three of the nominations are straight-forward in this category: Charli XCX, Iggy Azalea and Sam Smith were all strong on the charts this year and are all worthy contenders for the Award. The other two slots require a little more thinking. I’m going for Aiko because “The Worst” hit #1 at Urban radio and both her EP, Sail Out, and full-length album, Souled Out, had top ten debuts on the Billboard 200 within this period. KONGOS also makes for a solid rock entry here, only because “Come With Me Now” is going to have a hard time competing in the ROTY/SOTY categories. That being said, I think they’ll be around for a while on the Alternative scene and that should get them a second look over. – Arctic Monkeys and The Black Keys should see some major love in the Alternative/Rock categories. A.M. from the Monkeys isn’t eligible due to a release last September, but “Do I Wanna Know?” should get a nod or two, as well as “Fever” from the Keys. – The R&B field will be packed with Beyoncé a plenty, though male stars Trey Songz and Usher could get in on the action. “She Came To Give It To You” from the latter singer, featuring Nicki Minaj, would be a great candidate. – I really want Barbra Streisand‘s Partners and Kelly Clarkson‘s Wrapped In Red locked in an epic battle for Best Traditional Pop Vocal Album. Tony Bennett and Lady Gaga‘s Cheek To Cheek should pop up there too. That’s it for now… once again, let me know you think below or find PGTC on social media by clicking the “Get Social!” tab. 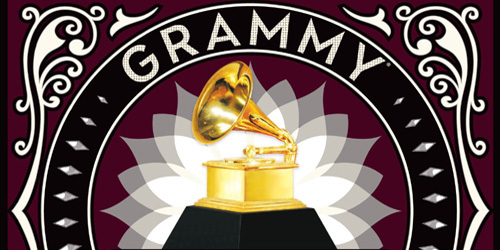 It’s finally here… the week before the 56th Annual GRAMMY Awards, airing on Sunday, January 26 at 8PM Eastern on CBS. This week on POP! Goes The Charts, we’ll be taking a look at nearly half the categories on the list and laying out who I think will taking home a prize or two or five (maybe!) on the big day. Let’s go for the Dance and Pop fields, shall we? PREDICTION: Difficult decision right here. “Brave” and “Roar” will probably cancel each other out (if only Bareilles and Perry would do a medley on GRAMMY night!) A safer choice would be Bruno Mars‘s “When I Was Your Man”; it’s a classic ballad. PREDICTION: This is tough too. Looks like we’re going to have another year where the winner of this category also wins one of the Big Four, whether it’s “Blurred Lines”, “Get Lucky” or “Just Give Me A Reason”. I’m going with the Pink and Nate Ruess duet. PREDICTION: Again, this isn’t my best area of expertise, but I know a lot of these names from the occasional look at the Jazz survey. A version of “Puttin’ On The Ritz” from Alpert’s album just got serviced to AC radio; it could be a sign that this this one is his. PREDICTION: Believe it or not, this is the only category in which Justin Timberlake‘s album is nominated for. Is that some major shade on the Academy’s part? Yet, the biggest album of last year has to win something, right? It would only seem fair to me. PREDICTION: With no Skrillex in the mix (and no Al Wasser, thank God), this category is probably going to go back to one of the bigger hits of the bunch, most likely “Clarity” or “Sweet Nothing”. Of the two, I prefer the Calvin Harris and Florence Welch song. PREDICTION: There was no bigger Dance album in 2013 than Random Access Memories. Daft Punk didn’t just get lucky; they knocked it out of the park. The critical acclaim of Disclosure will keep it in the running, but the French duo will likely take it. PREDICTION: This category is usually a two horse race between Bennett and Bublé, and because the Canadian crooner didn’t win last year for his Christmas album, I think Michael Bublé is overdue for yet another win here. “It’s A Beautiful Day” indeed. PREDICTION: I don’t know a ton about this category, but the winners in past years have been a real mix of commercial releases and some lesser-known works. Though I’m placing Daft Punk for the win here, it could essentially be any one of these six. PREDICTION: I love Rob Cavallo and would be thrilled to see him win this category, but 2013 was clearly the year of Pharrell Williams, both as a producer and singer, and he’s very much deserving of this honor. Tell Dr. Luke to go back to medical school. PREDICTION: Long after Lana Del Rey had been written off in the U.S., Interscope’s push of the Cedric Gervais remix of “Summertime Sadness” launched her at radio, selling over 2 million copies with all versions combined. Not so sad anymore, huh? Check back tomorrow to see what I take a second swing at predicting the Big Four! Until then, follow the blog below and find us on social media by click the “Get Social!” tab. It’s finally here… the week before the 56th Annual GRAMMY Awards, airing on Sunday, January 26 at 8PM Eastern on CBS. This week on POP! Goes The Charts, we’ll be taking a look at nearly half the categories on the list and laying out who I think will taking home a prize or two or five (maybe!) on the big day. Today, we continue with the fields for Alternative, Rock and Country. PREDICTION: It’s hard to deny the overwhelming success of “Radioactive” during the past year, but it’s only up for two categories, one being Record Of The Year, which is out of the question. (To me, at least.) This is the safer bet for the Las Vegas band. PREDICTION: While metal isn’t a genre of choice when it comes to my listening habits, I do know a little bit about the acts in this category. With their first studio album in 18 years, I’m hoping the reformed trio of Black Sabbath is rewarded with this. Performed and Written by: Gary Clark Jr. PREDICTION: There are classic acts galore in this category, along with a few newcomers. Gary Clark, Jr. would be a good choice for the win, but I think Dave Grohl, Paul McCartney, Krist Novoselic & Pat Smear have this. Just keepin’ it Reel. PREDICTION: I’ll say this category is probably going to be a fight between Bowie and Zeppelin – both albums did well. Though they have several entries in the GRAMMY Hall of Fame, wouldn’t it be cool to see Led Zeppelin win their first regular award? PREDICTION: There’s quite a few buzzworthy acts in this category, but people seemed rather surprised that Vampire Weekend was shut out of the Big Four. This is their only chance to win an award as a band this year, so I think it will easily go to them. PREDICTION: It’s a man’s, man’s, man’s year for this category, and while all five did particularly well on the Country chart, Hayes will probably take this honor. He’s the youngest in the pack and “Crazy” managed some minor crossover airplay in 2013. PREDICTION: It would be fantastic to see The Civil Wars win this one. That being said, if Taylor Swift is going to be at the show and performing, I’ll give her this one. (cue Swift’s shocked face) “Highway” was a #1 Country hit for the three performers. PREDICTION: This category is a little more balanced than the Performance award. I could conceivably see the lyric-driven “I Drive Your Truck” winning, but Kacey Musgraves is up twice here and I think she’ll be able to win for the song she performed. PREDICTION: Aldean, McGraw and Shelton have never won this category despite being nominated before, and don’t get me started about Red being classified as “Country album.” So, under careful consideration, Kacey Musgraves shall be the winner here. Check back tomorrow to see what I’m thinking for the Rap and R&B categories! Until then, follow the blog below and find us on social media by click the “Get Social!” tab.